An elegant solid 14k diamond eternity style wedding ring you will never want to take off your finger! This beautiful 9 diamond gold wedding band or anniversary ring in 14k yellow gold is a modern band with lovely faceted white diamonds each in it's own bezel setting. The brilliant full cut diamonds are set side by side in this contemporary eternity style ring that allows you to re-size easily if needed. 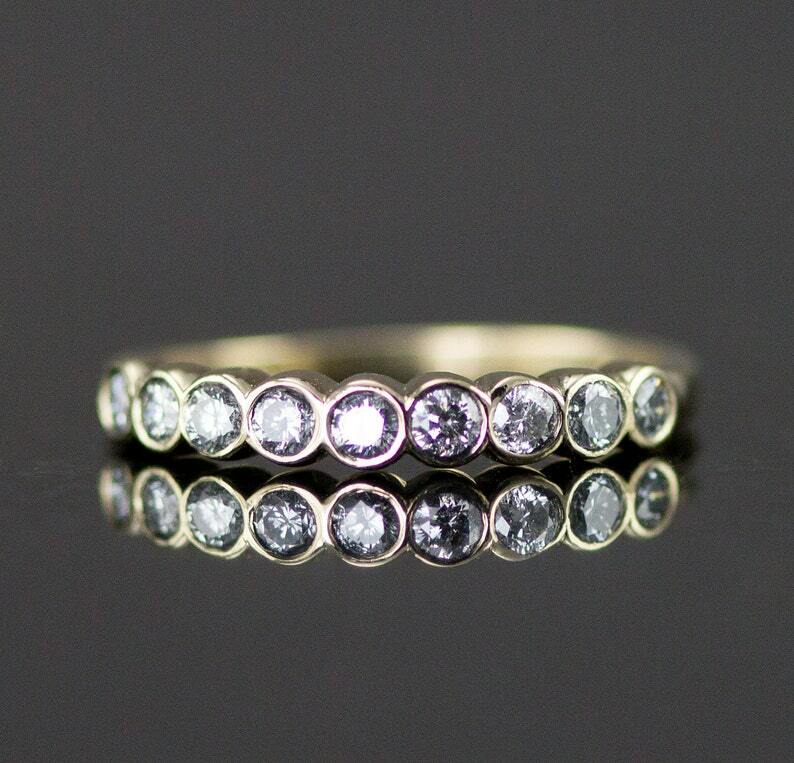 This ring will also make an immense hit as a stacking band! Diamonds range from 2.1-2.3 mm round are VS-SI1 and GH color for a total carat weight of .36 - .40. This ring is shown in 14k yellow gold but can be custom made to order in 14k rose or white gold, or in all colors of 18k gold. Palladium white gold is available for those with nickle allergies, contact me for pricing. Because life happens, I am very fond of half eternity bands. My rings are guaranteed for life meaning if you need to have tyour ring re-sized, this ring allows me to size up or down with changes you may need. Ring pictured is size 6.75 and ready to ship - all other sizes will be custom made to order in about 1 week. ***If you love the ring but aren't sure of your size, you may order this ring and ask me to send a ring sizer prior to me making your ring. I always suggest not having the stock ring re-sized unless you have an accurate recent size done before ordering. First ring re-size is complementary once you have your accurate size. Your ring will ship fully insured, signature required unless waived, in a rosewood box suitable for gift giving. I include a storage pouch and a square of Sunshine polishing cloth with every purchase. Shipping upgrades are available. Thanks for stopping to browse! I searched all over for a wedding band since I had some specifics -I have a vintage (1940s) engagement ring, so I wanted something that would look good with it and look good with my husband's wood band but I also wanted something a little unique - this was not easy to find. Then I came across Pennee's shop and her rings. I fell in love!